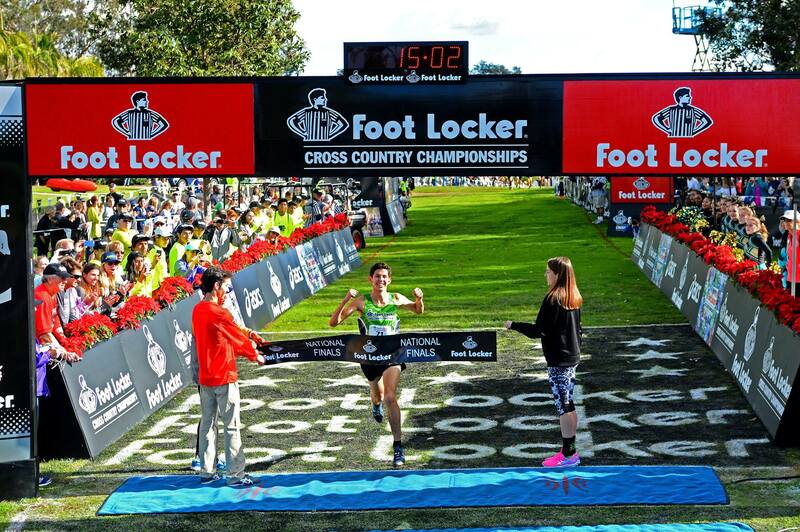 Fisher wins his second FLCCC title on December 13. Grant Fisher of Grand Blanc High School in Michigan defended his Foot Locker Cross Country Championships (FLCCC) national title on Saturday in San Diego, California. Fisher covered the 5,000-meter course in 15:03. Olin Hacker of Madison West High School in Wisconsin was second in 15:12. Fisher ran four seconds faster than his victory in 2013, and he used his wicked closing speed to gap the field. The race attracts several of the quickest high school cross-country runners in the nation. Forty runners from four different regions completed the 5K. The West (31) edged the Midwest (37) in the team results. Fisher claimed his second consecutive FLCCC Midwest Regional on Saturday, November 29, in Kenosha, Wisconsin. His winning time of 15:00 was nine seconds faster than second-place Jesse Hersha of Concord, Michigan. On Saturday, Fisher won his 29th straight high school cross-country race and described his racing strategy, per USA Today‘s Jim Halley: “The first half of the race, I wanted to stay near the front and really keep an eye on everybody in the race. I wanted to make sure I knew what they were doing. By the first loop, I had a gauge on what everyone else was doing. The second loop, I wanted to stay in a good position to strike. The Cardinal finished runners-up to Colorado at the NCAA Division I Cross Country Championships on November 22 in Terre Haute, Indiana. Fisher will aim to contribute as a point scorer for Stanford during the 2015 XC season. Fisher completed an undefeated senior cross-country season on Saturday in San Diego. Earlier in the season on October 4, he posted a 5K cross-country PR of 14:43 at the Portage Invitational. He also claimed the MHSAA Division 1 state title on November 1 in 14:52.5, winning by nearly 27 seconds. Fisher missed the 2012 MHSAA state finals—his sophomore year—due to soccer. His two-sport balance was difficult considering his talent on the soccer field and his tenacious attack on cross-country courses. In 2013, Fisher ran at the state finals and won. And as you now know, he won Foot Locker last year, too. The Grand Blanc prodigy has chosen to focus solely on running, and we are pleased. Judging by his historic senior cross-country season and the possibility of running a sub-4:00 mile as a prep runner, I’d say Fisher made the right decision.